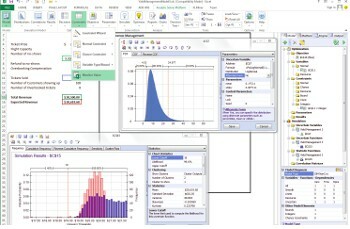 Welcome to our tutorial on Monte Carlo simulation -- from Frontline Systems, developers of the Excel Solver and Risk Solver software. Monte Carlo simulation is a versatile method for analyzing the behavior of some activity, plan or process that involves uncertainty. If you face uncertain or variable market demand, fluctuating costs, variation in a manufacturing process, or effects of weather on operations, or if you're investing in stocks, developing a new drug, or drilling an oil well -- you can benefit from using Monte Carlo simulation to understand the impact of uncertainty, and develop plans to mitigate and/or cope with risk. For background on simulation analysis and simulation models, consult our Simulation Tutorial. For background on risk analysis, consult our Risk Analysis Tutorial -- which is designed to sharpen your thinking about uncertainty and risk, and how to identify and quantify the uncertainties you face. In the next few pages, we'll show how you can convert a conventional spreadsheet model of a business plan sales forecast -- one that yields a flawed "average" Net Profit forecast based on average inputs -- into a far more realistic and useful simulation model that reveals the full range of Net Profit outcomes. And we'll show the power of Risk Solver software with Interactive Simulation -- which Dr. Sam Savage calls "a cure for the Flaw of Averages."